No, I’m not being funny. I have been asked exactly this question a while ago by someone I told about this blog. It was a man in his late forties. He wasn’t really sure what I meant when I was saying I wrote a blog about war movies. It’s a genre he isn’t familiar with and he finds it highly dubious. He asked me this question to fully understand what it was that I was reviewing and writing about. Guess if he had been a bit younger the question would have been either “Is Saving Private Ryan a war movie?” or “Is The Hurt Locker a war movie?”. What I’m getting at here is that there is such a ting as THE war movie. A movie that is known far beyond the borders of the genre and by an audience that will normally not watch war movies. I don’t think it is a coincidence that he chose Platoon. Platoon and Apocalypse Now used to be the exemplary movies whenever people were talking about war movies, whether they were aficionados of the genre or they belonged to those who despise the genre. It is hard for someone like me who has seen a lot of war movies to try to find out which is the movie that comes to mind first upon hearing the expression “war movie”. Now that I’m writing this post it’s pretty hard to think of any other war movie than Platoon. Still, for some weird reasons, the war movies which seem to be the most representative of the genre for me are Vietnam movies and that’s why, I guess, I would think of Platoon. This has nothing to do with “favourite movie”. A favourite movie could be far less typical. How about you, which is the movie you think of first, which is the one that embodies the genre for you? This entry was posted in Movie, Poll, War Movie and tagged Movies, Poll, War Movies. I voted but I think we (general audience) probably have a range of ideas about what constitutes a “war movie.” You stretch the definition with the films you review but I like that and that’s all where the “all about” comes into it. Exactly, that was the idea. I couldn’t only focus on the “real war movies” which means, for most people “combat movies”. Still the question was surprising. First – the are many men – not only women – who would never watch a war movie and even those have a very clear idea what they think is a war movie. I never thought about this question before. For me, it a movie has anything to do with war, even on the home front or the years following a war, I think about it as a war movie. War played a part in the story. You’d be surprsied, whole books have been filled about this topic and I’m going to do a post on it some day. there are some very stritc definitions. That why I say, my blog is about war moviea dn war time movies. I hope it’s just me, but I don’t get the connection between the first paragraph and the rest. Am I missing something? It sounds to me that you had a converstation with a moron. How big of an idiot do you have to be to either not be familair with “Platoon” (you say he is in his 40s) or if you are familiar with it, to wonder if it is a war movie?! If it is not a war movie, there is no such thing as a war movie. The rest of the post is intriguing. First, in my opinion, a war movie is a movie that has characters directly effected by a war that is going on during the movie (Sorry, “Colonel Redl” and “A Soldier’s Story”). I do not classify movies that cover people after the war is over as a war movie (sorry, “Best Years of Our Lives”). Not every movie about the home front is a war movie. The people must be directly effected by the war. I also do not classify the Cold War as a war so I am leery about spy movies set in that period. “Dr. Strangelove” – yes (because there is some fighting). “The Third Man” – no. Finally, I have a separate category called service comedies to cover movies like “Stripes”. I see where you are coming from, his question was quoted as it was asked, his problem was he didn’t think I’d be the type who would watch war movies and therefore he wanted to make sure that movies like “Platoon” were really what I was talking about. It seemed to be the film which embodied the concept the most. He hadn’t seen it nor has he seen any other movies. I think someone younger hostile or not interested in the genre would have mentioned Saving Privaze Ryan or The Hurt Locker because it won an Oscar. My list for the poll had nothing to do with what I think. I deliberately left out Black Hawk Down – not sure anyone would think of it first – not even I do, although, as you know, it is my favourite. It has alos somethig to do with clichés. Blach Hawk Down is too hard to even be noticed by most, there isn’t a main charcater – lie in Platoon or SPR. Did you look at the poll results? The Great EScape has been chose twice already. I had to start somewhere, couldn’t include them all. I think “All Quiet” is too old for many to remember. Assuming the guy who asked the question wasn’t just pulling your leg or giving you a hard time, I have to agree with warmoviebuff unless the guy who asked the question just doesn’t know anything about American movies. 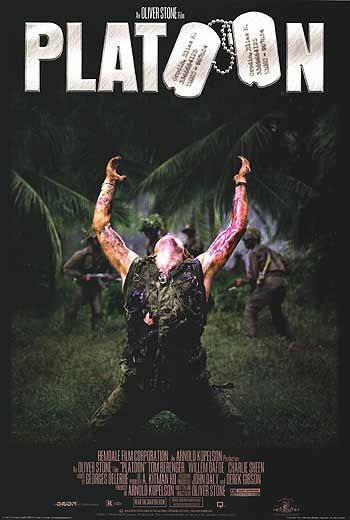 Most people his age I know who saw Platoon when it came out thought it was one of the most intense war movies ever, although my personal opinion is that it hasn’t aged all that well. What would it be if it wasn’t a war movie, though? A buddy movie with guns set in Vietnam? Weird! He didn’t pull my leg at all and he got a weird look from me. But when I said, yes, indeed that’s what I mena, I got the weirder look. He hasn’t seen the movie. That’s interesting, you think it asn’t aged well? Why? I think it did but I’m partial to that dying scene. The “best” in my opinion is Black Hawk Down as anyone who has ever been in combat will tell you it gives you a feeling, so do SPR first 15 minutes. It’s been a very long time since I last saw Platoon, so please take my memory of it with a grain of a salt. I just thought it was very contrived in parts (or maybe not acted so well) in relation to the impact it first had on the much younger me the year it came out. I liked many of Stone’s films much more in the past than I do now, in fact; I basically think he’s often an over the top hack as a filmmaker although obviously a bright and impassioned guy as a person (I actually enjoy reading and watching interviews with him when I get the chance, but I appreciate him as a thinker much more than as a filmmaker). Black Hawk Down the movie is a standout for you? Interesting. It disappointed me a little for reasons I can’t remember well now (I haven’t seen it since the year it came out), but one of the main issues I probably had with it was that Mark Bowden’s nonfiction book that inspired the movie was so much more gripping and better told to my mind. I might have enjoyed the movie more if I had read it first. I think Black Hawk Down works on every level. I have not read the book though. I thought it was pretty intense and very anti-war. And I’m a sucker for great film music. Most movies with a Hans Zimmer score are favourites (with some exceptions, of course). The Thin Red Line is another favourite movie, more philosophical. And then I must say, some of the best “movies” are mini-series. I think I did a post on Oliver Stone’s movies. He is certainly one of the most important of the genre. I’m fascinated by the “sacrifice element” in Platoon. I had a typo above–I meant I might have enjoyed Black Hawk Down more if I had seen the movie first–but maybe I’ll watch it again one of these days on your recommendation. I remember thinking the book was spectacular, though. The Thin Red Line I remember enjoying, in part because of the philosophical aspect that you mention. Have you seen The Deer Hunter? Not a “war movie” in the traditional sense perhaps but very powerful nonetheless. I had a feeling it was a typo. I haven’t even reviewe it yet but I will. I did a whole series on The Thin Red Line, 4 posts last year that I consider to be quite good. Many people hate the movie and the fact it came out together with Savin Private Ryan is unfortunate. I think it is far better and part 5 of my series would have been a comparions. I lost steam but will still write it. I just voted for The Longest Day ( even if its more if a documentary do to the factual events )but i also think of Dien Bien Phu by Schoendoerffer when speaking of the greatest war movie. But in all fairness i haven’t yet seen The Hurt Locker. Just one question, witch version of All Quiet on the Western Front? 1930’s 1970’s? The Longest Day is a good candidate. I wouldn’t go as far as calling The Hurt Locker great but it’s quite impressive, especially if you don’t watch a lot of war movies and because it got an oscar. I was thinking of the 1930s version of All Quiet on the Western Front. I didn’t like the 70s one. It’s an outstanding movie, The Cross of Iron, I would say in my Top 20. I watched The Hurt Locker when it came out, not sure how keen I would be on watching it now. I called it “A War Movie gone Thriller” in my review. The way she filemd it was much more in line with an action movie than with a war movie although it depicts war. It’s very suspenseful, not sure if it’s really good. I think you will find, it’s highly watchable but there a better “war movies”.